Complement all your ambition and talent with a printer that will make you look every bit as good as you are. Delivers world-class results with reliability. With fast print speeds, innovative imaging technology, a 12,000-page duty cycle and sleek designs, they'll promote a professional image with every job you do. 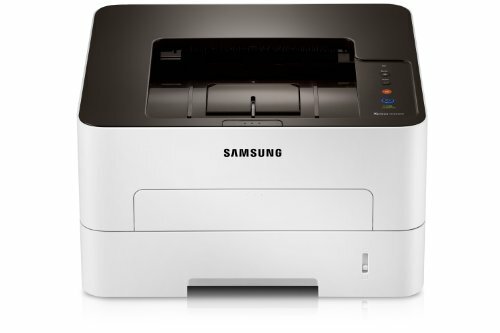 BEST VALUE FOR SMALL BUSINESSES - This Samsung single-function laser printer features superior print quality, WiFi connectivity, fast print speed, auto two-sided monochrome printing and built-in Ethernet. ONE-TOUCH WIRELESS SETUP - Simply press the WPS (Wi-Fi Protected Setup) button on your WPS enabled router and the WPS button on the M2825DW, and your wireless laser printer will automatically configure and connect to your wireless network. EASY MOBILE PRINTING - Download the free Samsung Mobile Print app, use AirPrint or Google Cloud Print and print directly with your mobile device from this wireless laser printer. FAST SPEED PRINTING - Print up to 29 pages per minute. Recommended monthly volume of 250-2,000 pages. ORIGINAL SAMSUNG CARTRIDGES - Use Samsung MLT-D116S standard and MLT-D116L high yield toner cartridges for best results. ONE-YEAR LIMITED HARDWARE WARRANTY - 24-hour, 7 days a week Web support.